As many of you know, I’m not a food blogger, nor do I often share recipes. But over the past few months, I’ve begun eating fridge oats for breakfast almost every morning and it’s been hugely beneficial. 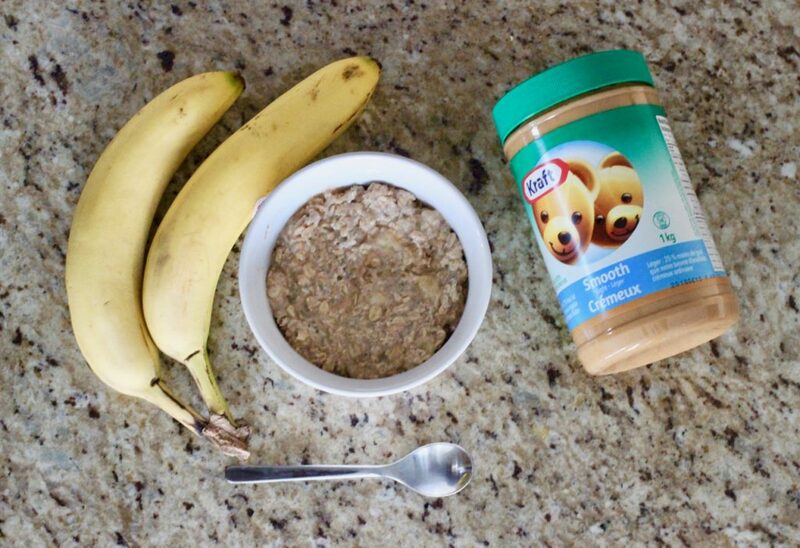 It’s the perfect quick breakfast that gives me the energy and focus I need to have a productive morning and start my day off on the right foot. I tried many recipes, but the one I’m sharing is my absolute favourite. It contains all my favourite breakfast flavours like banana, peanut butter, oats, and honey. It’s satisfying and comforting, and keeps me full for hours. Fridge oats are pre-made by combining oats with milk (and other ingredients!) to help the oats soften. In most cases, they are prepared several hours in advance and eaten cold. The texture is somewhat like a porridge. 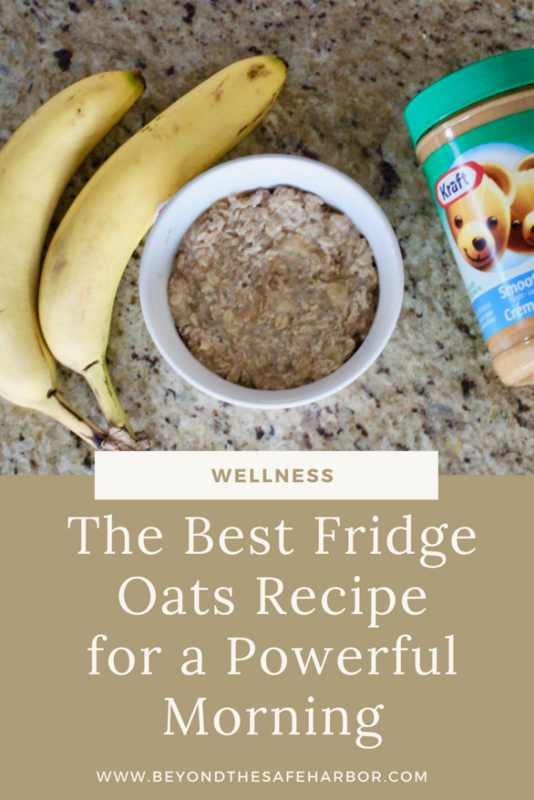 There are so many reasons to incorporate fridge oats into your diet! First, they are easy to prep. 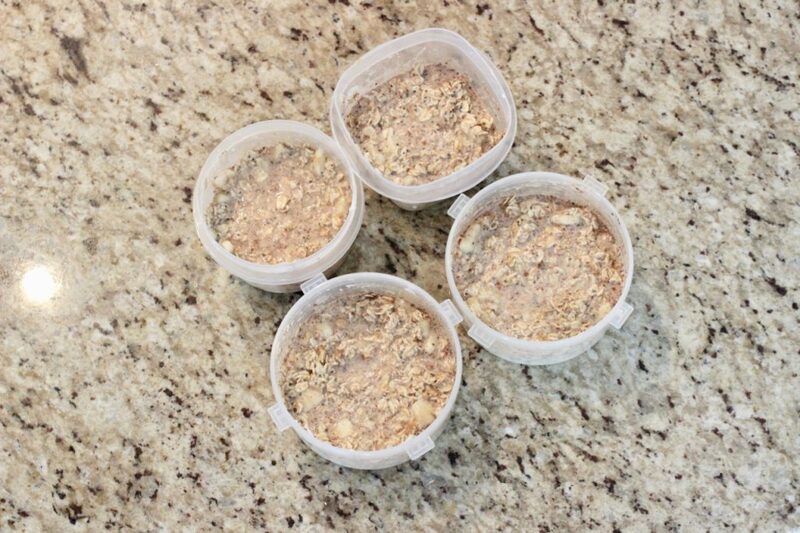 You can make most fridge oats recipes in batches and up to 4 days in advance. They need to sit for at least 2 hours anyways (overnight is best! ), so they are essentially designed for batch prepping. I make 4 at a time and they’re just as delicious on day 4 as on day 1. Second, you can eat the cold. That’s right – no microwave or stovetop needed. A perfect to-go breakfast that just requires a spoon. You can heat them up if you’d like, but I like mine cold. Third, they keep you full for hours. I’m often amazed at how long I stay full after eating fridge oats! They fuel me through my morning work, workout, and all the way until lunch. I rarely need a morning snack because they’re so filling. Last, they are super healthy! I’m no dietician, but fridge oats are a pretty healthy breakfast choice. 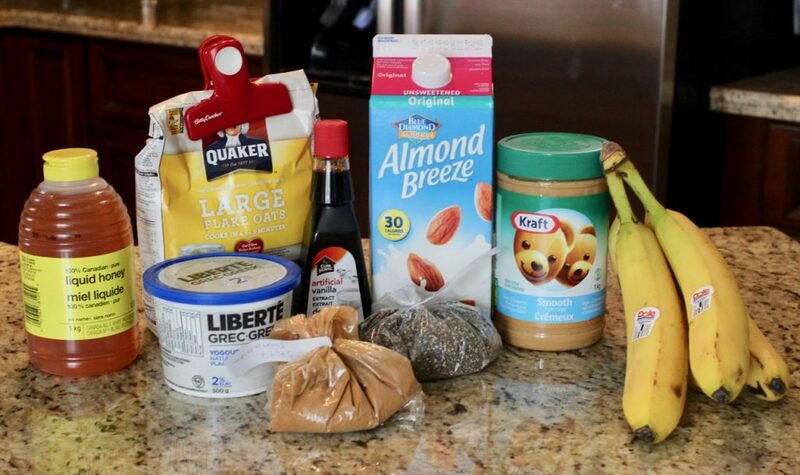 With plain greek yogurt, banana, chia seeds, peanut butter, and oats, they contain many fantastic ingredients. In short, combine all the ingredients in a small mason jar or plastic container and let sit for at least 2 hours or overnight. To serve, give it a good stir and eat cold. After adding the wet ingredients. All combined and ready for the fridge! The next morning: the fridge oats are ready to eat! 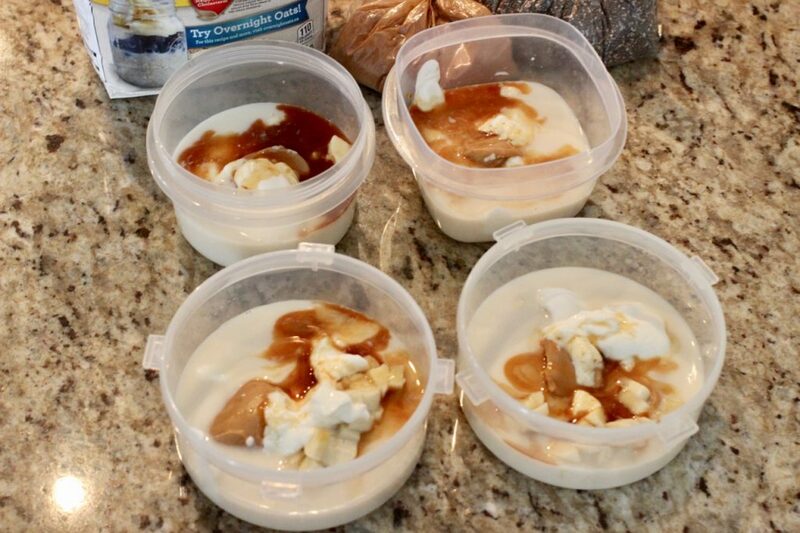 To make multiple servings, arrange several containers and prepare in one batch. 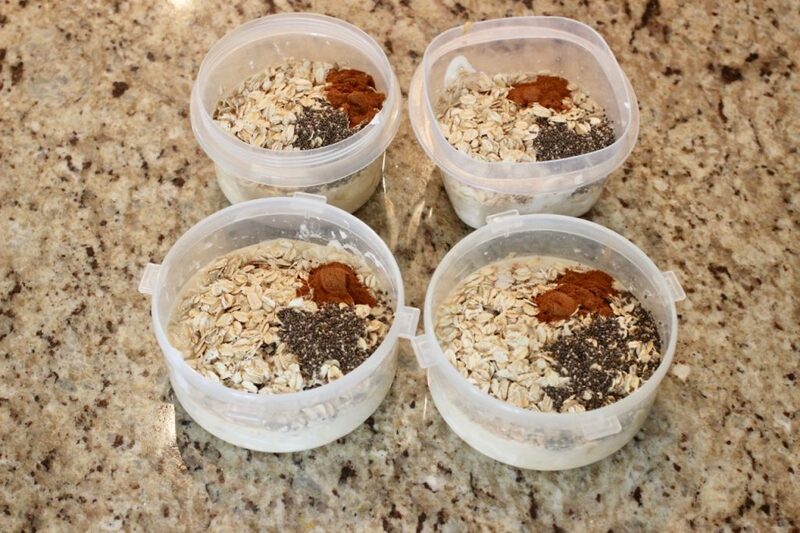 For example, put 1 tablespoon of peanut butter in each container, 1/2 cup almond milk in each container, and so on. Combine wet ingredients until smooth. Add in dry ingredients and mix again. Cover container(s). Store in the refrigerator at least 2 hours or overnight. I hope you love this recipe as much as I do! Let me know how it goes, and I’d love to see any pictures of the finished product!